NASA publication Spinoff highlights these research innovations that has benefitted the general public. Well, you can now add dizziness treatment to another NASA innovation to help motion sickness. Born of the need to quickly treat motion sickness which astronauts can suffer from up in space (imagine vomiting in zero-gravity), NASA developed a super fast-acting nasal spray to eliminate dizziness. Called INSCOP, it is essentially scopolamine which already is found in injectable, patch, and pill form. 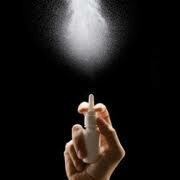 But, this new NASA nasal spray formulation acts faster and more reliably than the oral tablet. Under a joint agreement with pharmaceutical company Epiomed Therapeutics, it will hopefully soon become available to the public. Earlier, they also figured out what movements triggered the worst motion sickness as well as what at-the-time currently available medication combination(s) worked best to combat it. Read more. The efficacy of low-dose intranasal scopolamine for motion sickness. Aviat Space Environ Med. 2010 Apr;81(4):405-12. Dr. Christopher Chang is a private practice otolaryngology, head & neck surgeon specializing in the treatment of problems related to the ear, nose, and throat. Located in Warrenton, VA about 45 minutes west of Washington DC, he also provides inhalant allergy testing/treatment, hearing tests, and dispenses hearing aids. He is also the chief medical officer of O2Labz, a medical and scientific 3D animation company. One Tonsil Larger than the Other a Sign of Cancer? Does Upper Lip Tie Removal Help Prevent Upper Front Teeth Gap? Can Eye Drop Medications be Used in the Ear? This is a personal blog. Nothing on this blog is intended to create a physician-patient relationship or to substitute as medical advice. This is a PUBLIC site and you are not allowed to post any comments that are obscene, defamatory, spam, or fraudulent. Comments that are considered inappropriate will be deleted. We do not routinely review or respond to comments. We do not necessarily endorse any of the advertisement messages on this site. The opinions expressed here represent purely our own. Our practice is not associated with any companies portrayed in our blog. Copyright 2004-2018 by Dr. Christopher Chang. All Rights Reserved. This information may not be copied or used for any purpose without the express consent of Dr. Christopher Chang.